Nelson suggested he would consider coming out of retirement if quarterback Aaron Rodgers asked him to rejoin the Packers, Andrew Perloff of AT&T SportsNet's "The Dan Patrick Show" reports. Nelson plans to retire from professional football, James Jones of NFL Network reports. Nelson is scheduled to visit with the Seahawks on Tuesday, Adam Schefter of ESPN reports. 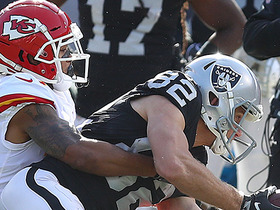 Analysis: The Raiders hope to re-sign Nelson at a lower price after they released him last week, and the Patriots, Titans and Chiefs also have expressed interest. The 33-year-old wide receiver will begin his free-agent journey in Seattle, where he'd have a good chance to beat out David Moore for the No. 3 wideout job behind Doug Baldwin and Tyler Lockett. It wouldn't be the best place to establish fantasy value, as the Seahawks easily led the NFL in run-play percentage (52.4) last year. The Raiders have released Nelson, Adam Schefter of ESPN reports. 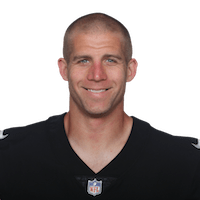 Analysis: The Raiders' overhaul at the receiver position continues, with Nelson sent packing after one season with the team, in which he caught 63 passes for 739 yards and three TDs in 15 games. Oakland's wideout depth chart is now topped by Antonio Brown and Tyrell Williams, while the 33-year-old Nelson will look to catch on elsewhere, two seasons removed from a 14-TD effort for the Packers in 2016. Nelson had nine catches (12 targets) for 78 yards in Sunday's 35-3 loss to the Chiefs. Nelson hopes to remain with the Raiders in 2019, Scott Bair of NBC Sports Bay Area reports. Nelson racked up seven receptions for 75 yards during Monday's 27-14 win against Denver. Nelson caught six of eight targets for 88 yards during Sunday's 30-14 loss to the Bengals. Analysis: Nelson led the team in targets, catches and receiving yards. A large chunk of his production came on a 44-yard gain that set up a field goal, but he failed to do make many other contributions. Despite the team's offensive woes as a whole, Nelson has been quite productive of late, with 22 catches for 233 yards combined over the last three games. Nelson caught six of his seven targets for 48 yards in Sunday's 24-21 win over the Steelers. 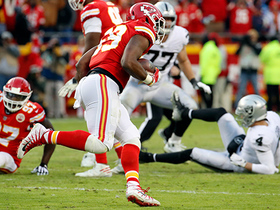 Nelson corralled 10 of 11 targets, logging 97 receiving yards during Sunday's 40-33 loss to Kansas City. Nelson (knee) wasn't listed Wednesday on the Raiders' Week 13 injury report, Michael Gehlken of the Las Vegas Review-Journal reports. Analysis: This comes as a bit of a surprise given coach Jay Gruden's recent comment that Nelson was "obviously not 100 percent" during Sunday's 34-17 loss to Baltimore. The 33-year-old wideout played 52 of 58 offensive snaps in the contest, finishing with one carry for minus-two yards and zero catches on one target. Despite the upgrade in his injury status, Nelson doesn't inspire much confidence heading into this weekend's matchup with the Chiefs. Nelson (knee) led Raiders' wide receivers with 52 offensive snaps in Sunday's loss to the Ravens despite being "obviously not 100 percent" according to coach Jon Gruden, Michael Gehlken of the Las Vegas Review-Journal reports. Analysis: Nelson may have only sat out six offensive snaps Sunday but was essentially a non-factor as he failed to catch his lone target and had one carry for negative-two yards. Seth Roberts and Marcell Ateman are currently serving as the team's No. 2 and 3 receivers, leaving Nelson as the clear top option at wide receiver -- on paper, anyway -- despite the injury. The 33-year-old's practice participation later this week should provide additional clarity for his Week 13 status. Nelson did not haul in his lone target during Sunday's 34-17 loss to the Ravens. He lost two yards on a single carry. Analysis: Nelson now has just two targets and no catches in his last two games. You'd have to go back to Week 5 for the last time the veteran target topped 20 yards in a game or scored. The Raiders' pass offense has been ugly lately, failing to reach 200 yards in three out of their last four games. Next Sunday's game against the Chiefs might be the cure if for no other reason than that the Raiders will likely need to throw a ton to keep up with the Chiefs. Nelson (knee) is active for Sunday's game against the Ravens. Nelson (knee), who is listed as questionable for Sunday's game against the Ravens, is expected to play, a source told Ian Rapoport of NFL Network. Nelson (knee) is listed as questionable for Sunday's game in Baltimore. Analysis: Nelson was limited at practice throughout the week, never quite making it back to full participation. A 2-8 team might normally take a cautious approach with a 33-year-old player, but the Raiders are badly in need of any NFL-level receiving talent they can get in the lineup. The team will release its inactive list approximately 90 minutes before Sunday's 1:00 PM EST kickoff. Nelson (knee) remained listed as limited at Thursday's practice, Paul Gutierrez of ESPN.com reports. Analysis: If Nelson is able to return for Sunday's game against the Ravens, he'd be a very welcome addition to Oakland's thinned-out receiving corps. The 33-year-old's production to date has been relatively modest, but ample snaps await him once healthy. Nelson (knee) was limited at Wednesday's practice. 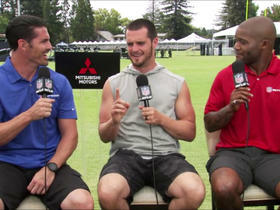 Analysis: Coach Jon Gruden previously relayed that Nelson has a chance to return for Sunday's game against the Ravens. While that's not a lock to occur at this stage, the veteran wideout would be a welcome addition to the Raiders' thinned-out receiving corps. Coach Jon Gruden said Nelson (knee) has a chance to return for Sunday's game in Baltimore, Paul Gutierrez of ESPN.com reports. Analysis: Nelson's inability to practice in any capacity last week suggests he may have a tough time avoiding another absence. The Raiders certainly could use him back in the lineup after losing Brandon LaFell to a torn Achilles in Sunday's 23-21 win over the Cardinals. The matchup doesn't portend success if Nelson is able to play. Nelson (knee) is listed as out for Sunday's game against the Cardinals after not practicing this week, Scott Bair of NBC Sports Bay Area reports. Analysis: It was initially reported that Nelson would be listed as questionable, but it's not a surprise to see that he won't play after missing all three of Oakland's Week 11 practice sessions. In any case, the veteran wideout hasn't been much of a factor over his last four games, with just five catches for 36 yards in that span. With Martavis Bryant (knee) also out Sunday, the Raiders' top options at wide receiver are Brandon LaFell and Seth Roberts. Nelson (knee) remained sidelined at Thursday's practice. Analysis: Nelson is dealing with a bone bruise in his knee, so what he does at practice Friday -- if anything -- will be telling with regard to his status for Sunday's game against the Cardinals. If he's unable to rally in time for that contest, the Raiders' top healthy options at wide receiver this weekend would be Brandon LaFell and Seth Roberts, given that Martavis Bryant is out with a knee injury of his own. Nelson won't practice Wednesday while he tends to a bone bruise in his knee, Paul Gutierrez of ESPN.com reports. Analysis: The injury clouds Nelson's availability for Sunday's game against the Cardinals, with a better picture on his outlook for the weekend likely to come based on what he's able to do in practices Thursday and Friday. With Martavis Bryant out with a knee issue of his own, the Raiders' top healthy options at wide receiver are Brandon LaFell and Seth Roberts. Coach Jon Gruden said he considers Nelson (knee) questionable for Sunday's game against the Cardinals, Matt Schneidman of The San Jose Mercury News reports. Analysis: The Raiders are awfully thin at wide receiver after both Nelson and Martavis Bryant suffered knee injuries during Sunday's 20-6 loss to the Chargers. Gruden has already ruled Bryant out for Week 11, but there's hope Nelson can avoid an absence. The 33-year-old doesn't seem likely to practice Wednesday. Nelson is being evaluated for a knee injury he sustained in Sunday's loss to the Chargers, Michael Gehlken of the Las Vegas Review-Journal reports. Analysis: Meanwhile, Martavis Bryant is on track to miss some time with a PCL injury, so the Raiders' wideout depth is being taxed in the post-Amari Cooper era. Next up for targets if Nelson sits out (in addition to Bryant) are Brandon LaFell, Seth Roberts and Dwayne Harris. Nelson re-entered Sunday's game against the Chargers after exiting the contest with a quadriceps injury, Michael Gehlken of the Las Vegas Review-Journal reports. Analysis: While Nelson was able to return to the field Sunday, fellow wideout Martavis Bryant was subsequently ruled out of the contest with a knee injury. Nelson exited Sunday's game against the Chargers with a quad injury. Analysis: Prior to leaving the game, Nelson failed to haul in his only target. In his absence, added looks are available for Brandon LaFell and Martavis Bryant. 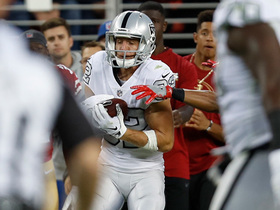 Nelson secured two of three targets for 16 yards in the Raiders' 34-3 loss to the 49ers on Thursday. Nelson caught one of four targets for 14 yards in Sunday's 42-28 loss to the Colts. 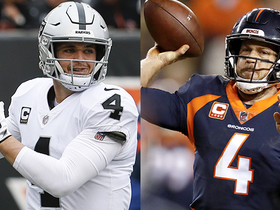 Analysis: Quarterback Derek Carr threw three touchdowns and rushed for another, but his success failed to lift up Nelson. With Amari Cooper now in Dallas, the veteran wide receiver should remain Oakland's top option at the position Thursday against the 49ers in Week 9 and beyond, but it's tough to count on him for consistent production with tight end Jared Cook and running back Jalen Richard also heavily involved in the passing game. Nelson is expected to serve as the Raiders' No. 1 outside receiver Week 8 against the Colts following Amari Cooper's transition to Dallas. Analysis: Nelson's potential volume in the Raiders' aerial attack figures to benefit from Cooper's departure, though expectations for a significant uptick in production may need to be tempered with a struggling Derek Carr (arm) at the helm. Running back Jalen Richard and tight end Jared Cook are slated to continue vulturing plenty of looks, while Martavis Bryant and Seth Roberts (concussion) present Nelson with underwhelming competition at receiver. Nelson managed just two receptions for six yards as the Raiders fell to the Seahawks at Wembley Stadium on Sunday, 27-3. Analysis: After three consecutive stellar outings between Week 3 and Week 5 (15 total receptions for 264 yards and three touchdowns), Nelson had his least productive game of the season against a Seattle secondary that ranked No. 6 against the pass coming in. Oakland limps into the bye, but upon re-emerging from the break will be granted a matchup against a Colts' secondary that's allowed 332 passing yards per game over the past three weeks. Nelson caught all of his four targets for 43 yards and a touchdown in Sunday's 26-10 loss to the Chargers. Nelson caught five of eight targets for 48 yards and a touchdown in Sunday's 45-42 overtime win over the Browns. Nelson caught six of eight targets for 173 yards and a touchdown during Sunday's 28-20 loss to the Dolphins. Through two games, Nelson has logged five catches (on eight targets) for 53 yards. Nelson caught two of four targets for 30 yards in Sunday's 20-19 loss to the Broncos. Nelson caught three of four targets for 23 yards in Monday's 33-13, Week 1 loss to the Rams. 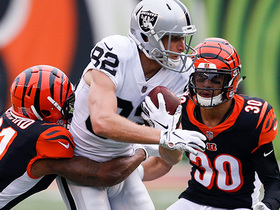 Analysis: Nelson was actually Oakland's most productive wide receiver in his Raiders debut, which shows just how little the team got out of the position in this game. 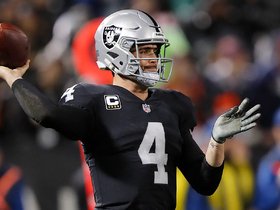 Quarterback Derek Carr couldn't get anything going with his weapons on the outside, instead checking it down to running back Jalen Richard and tight end Jared Cook, who combined for 235 yards on 18 catches. Nelson played just five offensive snaps during last Friday's 13-6 preseason win over the Packers and didn't see any targets in the limited action. Nelson won't play in Saturday's preseason game against the Rams, Michael Gehlken of the Las Vegas Review-Journal reports. Analysis: Among his five snaps in the Raiders' exhibition opener, Nelson was targeted twice by Derek Carr, corralling one of them for four yards. 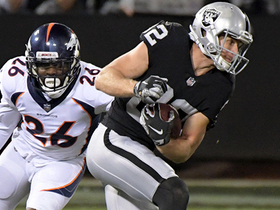 The Raiders are scratching a number of stalwarts on both sides of the ball Saturday, so Nelson should receive his most preseason action Friday against his old team, the Packers. Nelson caught one of two targets for four yards in Friday's preseason-opening win over the Lions. Nelson has agreed to terms with the Raiders, Adam Schefter of ESPN reports. Per NFL.com, the wideout's two-year deal is worth $15 million, including $13 million guaranteed. The Raiders are closing in on a contract with Nelson, Adam Schefter of ESPN reports. Nelson is visiting the Raiders on Wednesday, Michael Gehlken of the Las Vegas Review-Journal reports. The Packers released Nelson on Tuesday, Adam Schefter of ESPN reports. Analysis: At this point in his career, Nelson is Aaron Rodgers-dependent, posting no more than 35 yards in the eight games in which he played without the signal caller in 2017. While Rodgers will be back in the fold this season, Nelson's age (he'll be 33 in May) and cap figure ($12.5 million this season) likely swayed the decision-making process in Green Bay. The long-time Packer enters the open market with 69 touchdowns among his 550 receptions, but on the heels of a career-worst 9.1 YPC. Packers general manager Brian Gutekunst and head coach Mike McCarthy were adamant Wednesday that Nelson remains a key part of the team's nucleus, Tom Silverstein of the Milwaukee Journal Sentinel reports. Nelson (shoulder) may be asked to take a pay cut or even be released in the offseason, ESPN.com's Rob Demovsky reports. Nelson (shoulder) has been ruled out for Sunday's game against the Lions. Nelson (shoulder) didn't participate in Thursday's practice, Rob Demovsky of ESPN.com reports. Packers head coach Mike McCarthy said Nelson (shoulder) wouldn't practice Wednesday and "it'll be tough" for the wideout to receive clearance to play Sunday against the Lions. Analysis: Nelson will be limited to rehab work in the Packers' first official practice of the week after suffering a left shoulder injury in the Week 16 loss to the Vikings. The 32-year-old's fantasy upside was already capped with Brett Hundley filling in at quarterback for Aaron Rodgers (collarbone), so the likelihood that Nelson will be less than fully healthy if he's able to defy the odds and suit up Week 17 probably makes it best to avoid him in both season-long and DFS settings. The Packers ruled Nelson out of Saturday's contest versus the Vikings with a shoulder injury. Nelson is questionable to return to Saturday's contest against the Vikings due to a shoulder injury. Analysis: On a catch late in the second quarter, Nelson came to his feet and favored his left arm as he returned to the huddle, per Ryan Wood of the Green Bay Press-Gazette. Nelson remained on the field for one play before heading to the sideline, after which he underwent an evaluation during halftime. The nature of Nelson's injury is unknown at this time. Nelson's involvement in the Packers' passing attack could remain limited with Brett Hundley set to start at quarterback in Green Bay's final two games following Aaron Rodgers' (collarbone) placement on injured reserve. Nelson brought in three of six targets for 28 yards in Sunday's 31-24 loss to the Panthers. Packers offensive coordinator Edgar Bennett doesn't expect the long layoff to impact Nelson's chemistry with Aaron Rodgers (collarbone), Wes Hodkiewicz of the team's official website reports. Nelson caught four of five targets for 33 yards in Sunday's 27-21 overtime win in Cleveland. Nelson brought in five of eight targets for 17 yards in Sunday's 26-20 overtime win against the Buccaneers. Nelson caught three passes for 11 yards in Sunday's loss to the Steelers. Nelson caught two of six targets for 24 yards during Sunday's 23-0 loss to the Ravens. Analysis: Nelson tied for second on the team in targets, but his inability to get in sync with Brett Hundley reared its head again. He finished fourth among Green Bay pass catchers in yardage and has now totaled just 92 yards in four games with Hundley as the starter. Nelson's fantasy value seems to be at a season low at this point, and he seems unlikely to get back on track next week against a stingy Steelers defensive unit. Nelson caught three passes for 20 yards in Sunday's victory over the Bears. Nelson caught four of seven targets for 35 yards in Monday night's 30-17 loss to the Lions. Analysis: Nelson was kept in check by a combination of great coverage from Lions cornerback Darius Slay and limited downfield attempts from quarterback Brett Hundley. While the transition from Aaron Rodgers to Hundley always figured to hurt Nelson's fantasy stock, his mere 48 yards in Hundley's two starts evidence that harsh reality. With another week to prepare and a much better matchup in Week 10 against the Bears, however, Nelson will hope a better connection is found in Chicago. Oakland Raiders wide receiver Jordy Nelson gets wide open for a 44-yard catch. 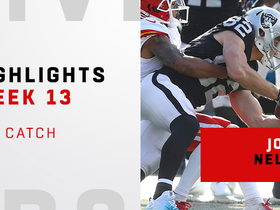 Watch every catch from Oakland Raiders wide receiver Jordy Nelson's 10 catch, 97-yard game against the Kansas City Chiefs in Week 13. Oakland Raiders wide receiver Jordy Nelson makes a 10-yard catch for a first down.